If you’ve never used Google Keyword Tool then just start off with Google Keyword Planner, and read on! If you’re familiar with keyword planning and Keyword Tool and need help locating where the usual features are, skip this section and get on with the next part! 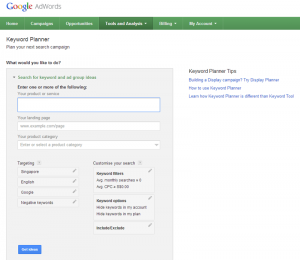 Keyword tool is located at https://adwords.google.com/ko/KeywordPlanner/Home or if you’re logging in from the AdWords page, it’s under the Tools and Analysis tab. You’ll need to sign in with your Google account. First of all let’s get to the necessary information when it comes to keyword planning. The historic number of searches – because the numbers displayed is a 12 month average, you don’t want to hit on a 1 time trend. Take “Christmas Trees” for example, the search volume for this peaks in December and gets almost no notice for the year from Jan to Sep, because of this spike, the average monthly search number gets bumped up to about 8000 per month. Where in reality they get close to no business the entire year. We’ll get to this later on. Everyone can join in from here! 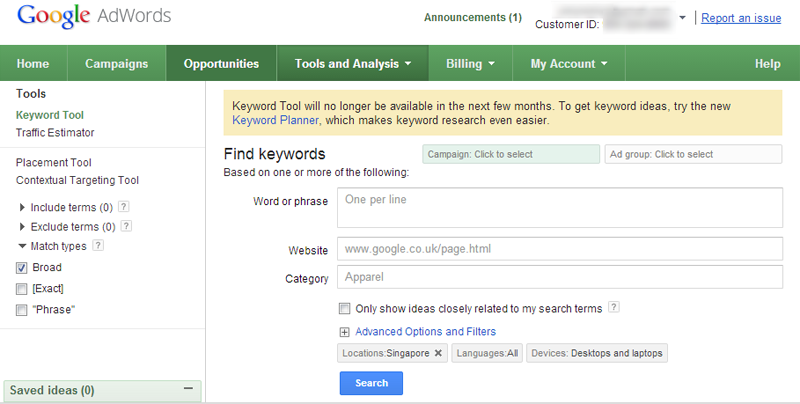 On this page, you’ll need to enter the keywords you want, each keyword on a new line. I would recommend that you research on 1 keyword at a time. Unless you are trying to do some correlation and comparison. For the moment, we’ll ignore the landing page and product category field. You can enter something in there if you like. Next set the locale you are targeting. I’m based in Singapore so I have mine set as such. If you do not set a location, you are targeting global search results. Always choose a geographical region and the more specific the better. Unless of course you are indeed targeting a global market, in that case you need to specify if English is the main communication language. Leave the filters on the right column alone and click on Get Ideas! Now you’ll be greeted with a new page that displays your keyword ideas, you can play around with how the data is presented to you by click on the tabs “Ad Group Ideas” or “Keyword Ideas” I prefer the Keyword Ideas but you can also try Ad Groups. The search type options are now hidden, you got to click where the red arrow points to show it. By default it is set to “Broad” and that isn’t what we want, we shall set it to “Exact”. Also the new Keyword Planner shows you (almost) exactly how many searches for this keyword was being looked up in the last 12 months! 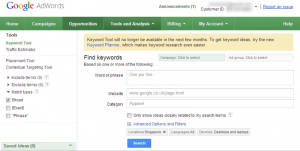 No more toggling between Insights and Keyword Tool! In my opinion, Google has done us a great job by providing us with a new platform before killing the old one and makes transitioning easier. I love how the negative keywords and charts come right up in 1 page instead of switching between pages. I love the old Keyword Tool probably because it’s something I’ve been using for years. Hey! 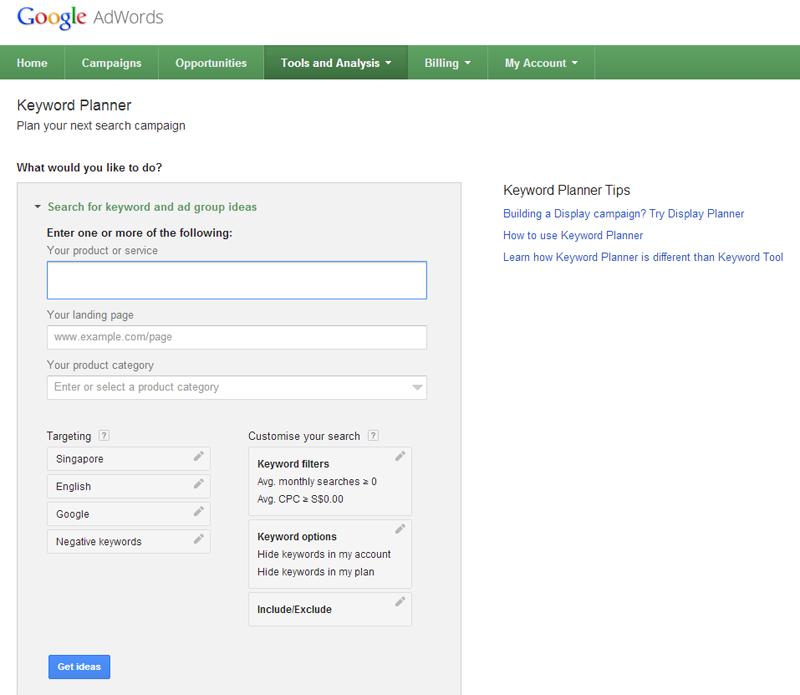 Keyword planner is quite good too! Give it a go this weekend!